With it being the eve of the Stanley Cup finals between the L.A. Kings and New Jersey Devils and Jon Quick about to become the first former UMass player to compete for the world’s greatest trophy, I thought I’d post a tribute to him. 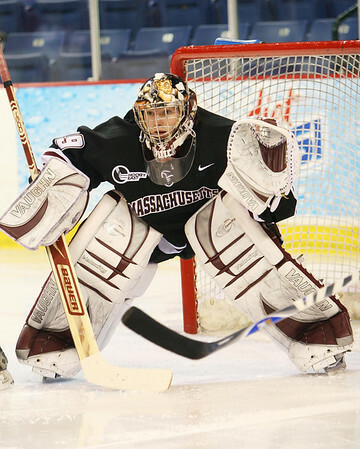 It has been five years since Quick wore the maroon and white, leading the Minutemen to their first (and unfortunately only) NCAA appearance and victory. Since that time UMass fans have followed Quick’s journey from Amherst to the ECHL, AHL, and eventually the Staples Center. Many UMass fans have jumped on the Kings bandwagon throughout the playoffs, hoping to see a former Minuteman’s name etched upon the cup. But, despite only being at UMass a short time, Quickie will always be a Minuteman. 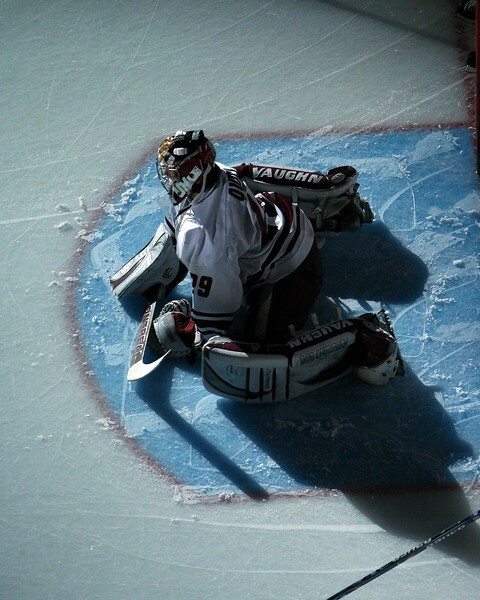 Thanks to Karen Winger Photography, let’s remember back to the days before he traded maroon for purple and black. Good Luck, Quickie! Bring home the Cup! Coach Toot Cahoon has been quoted in a couple different mainstream media features on Quick. First was this piece from earlier in the month covering Quick’s evolution from freshman at UMass to Conn Smythe candidate which has a lot from Cahoon. And then this is an interesting story from the Orange County Register featuring quotes from Cahoon and even acknowledging that UMass fans knew him as Jon, not Jonathan. Watching Quick excel in the NHL and now the playoffs has been great for UMass fans. It’s always enjoyable to see an alumni, athlete or not, move on from Amherst and enjoy success. Secondly, Quick, despite his short stay, is a big part of UMass hockey history and I’m happy for him and his family to see him do well. Thirdly, the local hockey team didn’t get too far this year so at least I can have some rooting interesting in the playoffs. But lastly, the better Quick does, the more he and his background get mentioned on TV, it’ll only help the UMass program. Fans of UMass hockey are always beating their head against a wall asking how can can this program, with too little success and without a well-publicized tradition, compete with the BCs, BUs, and UNHs of the world? Well having the University of Massachusetts name attached to a player seen as one of the elite at his position worldwide is certainly one step towards that goal. Of course Quick met the press on Media Day with his hoodie up. I just wanted to pass along a few links before disappearing for the holiday weekend. ESPN Boston had this short story on 2013 recruit Mike Iovanna where he states that “UMass fits me”. One other note on the recruiting front. Chris Heisenberg’s site has changed Kenny Gillespie from arriving at UMass this fall to coming in 2013. This is something I speculated on previously since Gillespie had a tough time cracking the top two lines on his USHL team. If this information is correct I think it’ll benefit everyone. The Stanley Cup Finals are set and former Minuteman Jon Quick will be facing the New Jersey Devils and Marty Brodeur starting on Wednesday. The Republican mentioned Quick and Western Mass native Dean Lombardi, LA’s GM, in a recent story. Hockey East is hiring a full time Officiating Coordinator. No word if a vision test is part of the qualification process. Well, if I knew that all I had to do was complain about the lack of recruits in order to get a huge influx of commitments, I would’ve done so earlier. UMass has now gotten six recruits since that piece was written in February, with the latest being right winger Evan Stack. Stack goes 6’1’, 185lb and, as a 1991 birthdate, is slated to come to Amherst this fall (more on that later). Last season Stack was the captain of the Merritt Centennials in the BCHL where he had 32 goals, including 6 game winners, and 29 assists in 60 games. He also had four goals and three assists in nine playoff games. He was named MVP for the Cents this past season and was named BCHL Player of the Week at least once. His goals put him among the top 15 in the league. Here’s a getting to know you piece from this past season. Also on youtube are some highlight packages from 2009 to 2010 as well as 2008 to 2009. So at first glance this seems like a good get for the coaching staff. It’s not everyday you can add a mature goalscorer with decent size from a top notch junior league like the BCHL. Especially in late May. I do have to wonder how no other schools have picked him up previously. Regardless, he looks like someone who could come in next fall and contribute right away. But how is there room on the roster for him to come in next fall? I have no idea. 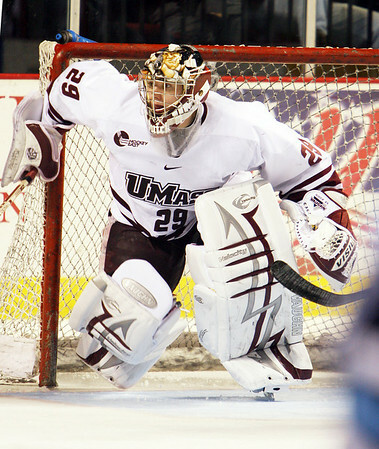 Remember, UMass graduated four players, one being a 4th goaltender. Yet, according to Heisenberg, there are now four forwards and a defenseman slated to come in next fall; Shane Walsh, Kenny Gillespie, K.J. Tiefenwerth, Connor Doherty, and now Stack. Obviously there is some shakeup to the roster if all five of those are coming to campus in the fall. But as of now I’ve yet to learn what those potential changes may be. edit: Just noticed that Stack’s page on the BCHL site says he’s committed for 2013. While this could be true, it would also mean he’d come to Amherst as a 22 year old freshman, which would be odd. We’ll see. Last summer I got a message via Twitter from a former player suggesting a feature on Fear The Triangle where I catch up with ex-Minutemen. It was a good idea and one I had kicked around myself but the summer months came and went and I never got around to it. However I knew it was something I wanted to revisit during this offseason because I really want to keep the blog active at least semi-regularly and this type of post is a great way to do so. Plus it’s a great chance for those who have been following the program for a while to see how the guys we used to cheer for are doing now as well as helping newer fans learn some UMass hockey history. So when I made the decision to add the Where Are They Now posts to the FTT rotation, it seemed only fitting that I start with the former player who pushed it last year, Keith O’Connell. O’Connell, a Catholic Memorial graduate, transferred to UMass in 1993 after playing one season at Boston College. After sitting out a year per NCAA rules he joined the Minutemen on the ice for the school’s inaugural season in Hockey East in 1994-95 and was a mainstay on defense for those early triangle years. He would go on to play in the ECHL and even had a short stay with the Providence Bruins in the AHL before hanging up the skates. Fear The Triangle: What have you been up to since leaving UMass? Keith O’Connell: Since leaving UMass I played three years pro hockey in both the ECHL and a quick cup of coffee in the AHL. That all ended at the end of the 1999-00 season. That same year I got engaged to my now wife Amy Cahill (UMass ‘97). After hockey was done I went to work with Reliance Standard selling employee benefit programs for 3 years. I then jumped ship and started working with my father and the O’Connell Insurance Group for the last 9 years. I have since started OIG Wealth Management which acts as the Financial Services arm to O’Connell Insurance Group. I am also a partner and Dir. of Investor Relations of Capital Equity Partners LLC, a real estate development firm in Boston. I got married in 2002 and have three sons, Max, Charlie and Sam. 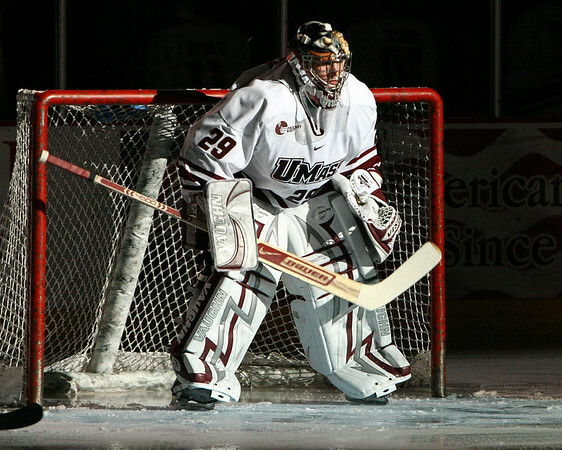 FTT: What’s your favorite memory of playing hockey at UMass? KOC: Beating Maine in 1994 when they were #1 in the country in front of 8,000 and scoring the game winning goal against BC my senior year on Senior Night at the Mullins Center. FTT: Do you still follow the UMass hockey program? KOC: I do, and root for them win or lose! Best school in the country and it won’t be long before the hockey team is too! FTT: What’s the biggest difference between when you played and now, in terms of UMass hockey or Hockey East in general? KOC: The skill! We had good players and I played against some unreal players like Mike Grier, Chris Drury and Paul Karyia to name a few. But, I think Hockey East is the best league and the fact that more and more kids are making it to the NHL from Hockey East speaks volumes. FTT: Is hockey still a part of your life nowadays? KOC: Hockey is still a big part of my life as a fan and now as a coach. Two years ago I was the assistant coach for the U16 Boston Advantage, owned by Tim Lovell (UMass ‘98). 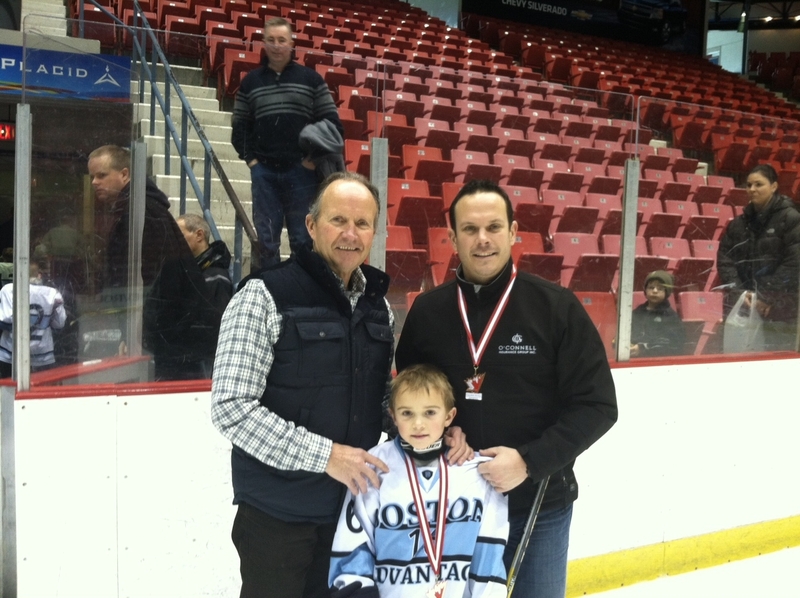 And I now coach the 04 Terriers with my father (BU Class of 66) and I coach my son Max. FTT: Is there a favorite restaurant, take-out place, or bar in Amherst that you miss the most? 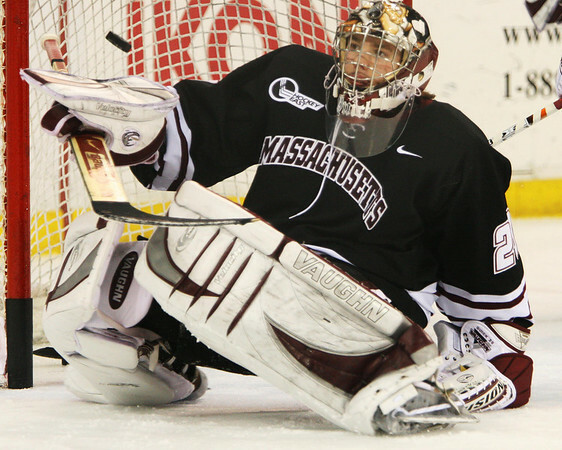 Thanks to Keith for taking the time to share with FTT readers what he has been doing in his post-UMass years. I know a lot of readers have asked whether captains have been announced or when that might happen. I did learn that they likely won’t be named until the players are back on campus in late summer/fall. This is primarily because the coaching staff wants to make sure they players who best show leadership are given the letters. With such a large and talented junior class that will be depended upon quite a bit, it’s not as easy as selecting three seniors. It’s also not out of the norm for captains to be named that late as we saw before the 2010-11 season. For those who missed it, here are my picks for captain next season. Don’t forget to signup for this year’s Pond Club Golf Outing. Can’t make it? Sponsor a hole. Can’t golf? Do what I do, sponsor a hole and show up for the post-golf cookout. Last year US Hockey Hall of Famer John LeClair was in attendance. Who will be there this year? It’s always nice to have a reason to post about UMass hockey two days in a row in the middle of May when usually nothing is going on. And with a little luck I’ll be posting later this week or weekend with a brand new FTT feature, “Where Are They Now?”, where readers will get a chance to catch up with some of their favorite Minutemen of the past. I’ll save the identity of the first former player spotlighted as a surprise, but I will tease with the fact that he did in fact wear the legendary triangle for his entire UMass career. But today’s reason for posting is not to look back at a player who once wore the maroon and white, but one who will. UMass has picked up a commitment from Junior Bruins defenseman Connor Doherty. It’s evident by looking at the UMass roster that the name Conor/Connor was extremely popular about 20 years ago. Doherty is a ‘93 birth date and a Holden, MA native who goes 6’2” 190lbs. He had four goals and 14 assists in 35 games for the Bruins this year. In the EJHL playoffs he had a couple of assists in four games. Like his previous and future teammate K.J. Tiefenwerth, he was an EJHL All-Star this past year. The previous year in the empire league he was 2nd team All Conference. Considering he was still playing in the Empire a couple seasons ago it appears he may be considered a late bloomer. Overall there is very little about him out there on the interwebs. It should be noted that UMass has had a lot of success with Junior Bruins in the past. Guys like Greg Mauldin, Alex Berry, Topher Bevis, Matty Burto, Dave Leaderer, and Colin Shea all played for the Junior Bruins. Conor Sheary played for them before moving on to Cushing Academy. Incoming recruit K.J. Tiefenwerth was captain for the Bruins this past year and soon to be sophomore Andrew Tegeler, who I think will play a much greater role on next year’s squad, played for them as well. Now, the real interesting part is that, according to the venerable Chris Heisenberg, Doherty is committed for next year. If that’s true, some kind of shakeup has occurred with either the returning roster or the incoming recruits. It was my understanding that despite graduating three scholarship players the team really only had two scholarships/roster spots to offer (meaning the third scholarship would go, either as a whole or fractionally, to existing players). UMass, according to Heisenberg, now has four players committed for this fall with Doherty, Tiefenwerth, Shane Walsh, and Kenny Gillespie. When Tiefenwerth first signed on I speculated that maybe Gillespie would defer a year, but from the evidence I’ve gathered, that doesn’t appear to be the case. So, in all honesty, I don’t know what’s going on with the roster. Without consideration for the overall roster numbers, Doherty’s addition seems to make sense. The top five spots on defense are likely set in Joel Hanley, Conor Allen, Colin Shea, Oleg Yevenko, and (despite his struggles this past season) Adam Phillips. But that sixth spot is up for grabs. Anthony Raiola did well as a freshman but played sparingly last year. Mike Busillo played better than most expected in intermittent duty but whether he can be an everyday Hockey East player has yet to be determined. Darren Rowe’s reemergence on the team was one of the better storylines for the season but question marks about his defense will linger. Yet, with all this speculation, maybe the website is just wrong and Doherty is coming in in 2013. We’ll see. Since I just posted yesterday and it is May, there’s nothing else to pass along. Make sure to check back in the next few days though went I debut the “Where Are They Now?” segment with a former Minuteman player. It’s been a week or so since my last update, so I thought I’d share some news and links in what I’ve now dubbed my “Up To The Minute” feature. The signup for this year’s Pond Club Golf Tournament, taking place on June 11th, is available. If, like me, you don’t golf but still want to participate somehow and support the program there are a number of different sponsorship opportunities available. Why does the program need you to be involved in order for the Minutemen be successful on the ice? Because UMass alumni are not writing $5 million checks for the program like elsewhere in Hockey East. Want UMass to compete with these teams? It all starts with getting involved with the Pond Club or attending events like the golf tournament or Reverse Raffle. Matt Vautour mentioned T.J. Syner as one of the UMass athletes listed (which may differ from reality) at 5 foot 9 inches who had big years for the maroon and white. Congratulations to Syner, Mike Marcou, Danny Hobbs, Kevin Moore, and all the student hockey fans who graduated this past weekend. Best of luck in your post-UMass endeavors! Nothing really new coming out of the recent UConn to Hockey East news, though the fact that we’re getting weekly “reports” with the same information probably means things are still progressing towards their likely addition. College Hockey News had this interesting testimonial from a doctor advocating that 3/4 face shields do in fact decrease injuries. Jon Quick continues to roll in the playoffs as his Kings took game one of the Western Conference finals despite some less than stellar goaltending from Quick. I remember him giving up a goal from center ice during his time in Amherst as well. NHL.com had a piece on Quick’s transformation from big man on the UMass campus to NHL goaltender. They also had 8 things you should know about Quick. I remember the hoodies and hip hop music quite a bit from his time in Amherst. I even remember him saying he would keep himself entertained when the play was on the opposite end of the ice by singing to himself. Game 2 takes place tonight at 9pm. Justin Braun and the rest of Team USA are onto the quarterfinals of the World Championships (note that Braun is wearing #20 in the picture in the link). Braun has played in all 7 of Team USA’s games but hasn’t registered any points. Mike Kostka is the lone Minuteman standing in the AHL playoffs as his Norfolk Admirals eliminated Casey Wellman and the Connecticut Whale on the way to the semifinals. Here’s an article on Kostka from a few weeks ago. Wellman has been added to the Rangers’ post season roster in case of injury. I thought this former player’s insightful piece on his choice between major junior and the NCAA was an interesting read. As you can see I’ve redecorated the blog a bit in honor of the UMass lacrosse team which begins its quest for a national championship this Saturday at Garber Field with a 2:30pm faceoff. Hockey season may be over but the lacrosse team is giving me a good excuse to spend my weekends on the Mass Pike to watch a truly historic and memorable season for a program that has always been one of UMass’ most successful. I was in Amherst again this past weekend and thoroughly enjoyed watching the team grab their first CAA conference championship with a win over Drexel. They’ll face Colgate in the first round of the NCAA tournament on Saturday and I hope any and all UMass fans show up to Garber to fill the hill and give this team a home field advantage. It doesn’t matter if you’re just jumping on the bandwagon and don’t know the sport. All you need to know is these guys are wearing maroon and white, their jerseys say “UMass” across the front, and are focused on bringing a national championship to campus. Personally I hope Garber is absolutely bursting at the seams and as a result Colgate is utterly unable to keep their heads in the games. As one of the 50 UMass fans who watched our football team get upset during a blizzard in Hamilton, NY in 2003 it’d be nice to have the environment in our favor for an NCAA game against the Raiders for once. Speaking of ridiculous NCAA tournament seedings, as hockey fans I think it’s time to give thanks for the Pairwise. It’s not perfect and we can always debate the formula that’s used (personally I’m a big KRACH fan), but at least all teams know where they stand and what has to happen for them to gain an tournament berth. Not the case in lacrosse when they lock five people in a room and who knows what the hell happens. As a result UMass despite being the #1 team in both polls, second in the RPI, 15-0 on the season, and CAA Champions, was given a sixth seed by the selection committee. It is what it is, luckily the team got a home game for the first round (some deserving teams, like Penn State, didn’t even get selected) and will have to fight to get to the Final Four at Gillette. But when the bracket was first announced I certainly was thankful for the transparency and straightforwardness of the pairwise. Whlie the lacrosse tournament is just starting, things are heating up in the Stanley Cup Playoffs. And, thanks to former Minuteman Jon Quick, the Kings are on their way to the Western Conference Finals. Quick has put up a 1.55 goals against and a .949 save percentage which has allowed Los Angeles to take out the top two seeds in the West; Vancouver and St Louis. Quick is considered the Conn Smythe favorite to this point and is even getting favorable comparisons to legendary Terry Sawchuk. Overseas Justin Braun and Team USA had an exciting overtime win over Canada on Saturday but dropped a game to Slovakia today. The team falls to 2-1 and is in fourth place in their group. In the AHL playoffs both Mike Kostka and Casey Wellman are still playing, but one of them won’t be for long as their teams are facing each other. The series between Kostka’s Norfolk Admirals and Wellman’s Connecticut Whale is tied at two apiece. Former captain Kostka has a goal and four assists in 8 games and is a +4 while Wellman has three goals and four assists in 6 games (though Minuteman fans will not be shocked to learn he is a –1 so far in the playoffs). In other alumni news, congratulations are in order to former UMass hockey beat writer Jeff Howe who will be covering the New England Patriots for the Boston Herald. Not a surprise. Howe was talented even when he was writing for the Collegian and most of the time was the best source for team coverage. The Schedule Page has been updated with some more dates that have been announced. All of the non-conference dates are now known except Quinnipiac. UConn comes to the Mullins on Friday October 12th while Colgate travels to Amherst for the weekend of December 7th and 8th. The Minutemen travel to Yale the following Wednesday, December 12th. Also, with football heading for Foxboro this fall, a home game against Boston University on October 27th will be part of Homecoming activities. 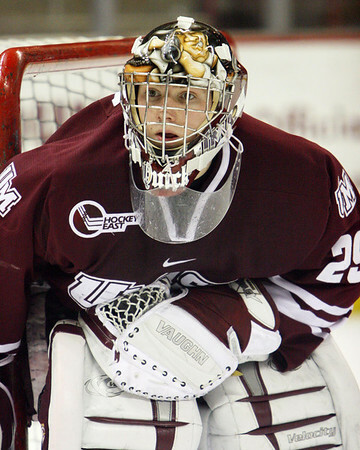 Last week I blogged about college hockey potentially going to 3/4 face shields. It does not appear that four on four overtime would join face shields as a rule change according to CHN. The last recruit update of the season as all of the prospective UMass players are done in their respective leagues. Gillespie’s Lancers are out of the USHL playoffs after losing to Waterloo in four games. Gillespie didn’t have any points in the playoffs, but did have 4 PIM. In recent weeks I’ve speculated whether Gillespie will be asked to come to campus in 2013 rather than this year. Given the reflective nature of his Tweets following his season, I’m guessing he’s Amherst bound this fall. Miller finished second on his team in goals, assists, and points as a junior. USHR ranked him as the 26th best among his class. His Wildcats won the New England prep championship for their level where Miller had a key takeaway and assist that led to the game winning goal. He’s due to return to KUA next fall. Thanks to Mike McMahon at the Mack Report we have a few more dates of the UMass schedule next season. The Minutemen will visit Merrimack on 2/9 and 3/8 before closing out the season on senior night against the Warriors on 3/9. This actually puts the end of the regular season a week later than this past year. Just a reminder that next year’s non-conference foes have already been made public. If you shift the schedule a week, these dates mirror the schedule so far from this past season. I also just realized that UMass hockey will be dictating where I’ll be spending my New Years Eve again. Hanover, NH? Yikes. The United States of Hockey profiles Team USA, featuring former Minuteman Justin Braun, which will compete in the IIHF World Championships starting Friday. McMahon also has some interesting news about the NCAA potentially going from full cages to 3/4 face shields. As someone who never played hockey, I can’t really comment on my personal preference. However the overwhelming opinion has always been that going away from the full shields/cages may actually reduce serious injury as it would make players more cautious and respectful. You always hear that the full cages can make them feel a little invincible when going in for a hit. With Paul Kelley’s recent firing, College Hockey Inc is looking to shake up its structure and governance.